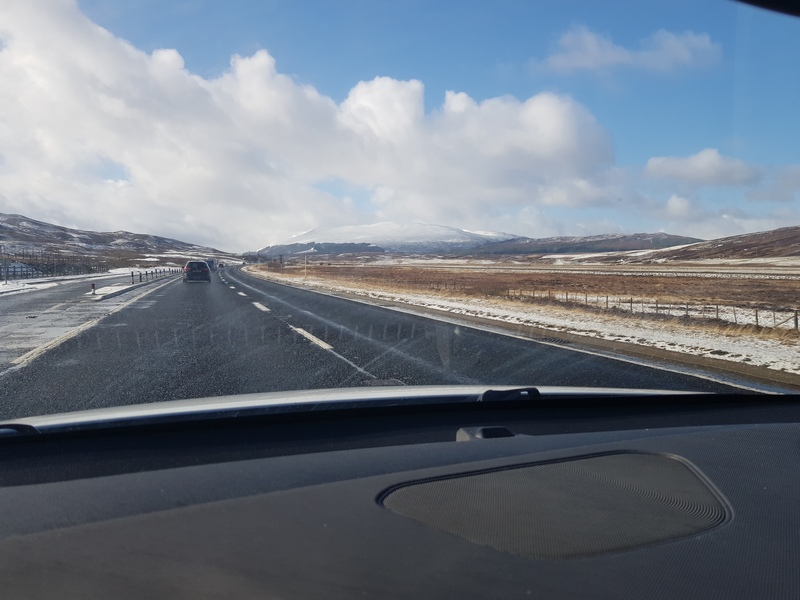 We started off by driving to Inverness and staying in the North Kessock Hotel – we have stayed there before and really like it. Not too expensive and a good restaurant so what’s not to like ? Actually it is less expensive than the Premier Inn in Inverness centre and it has character. Premier Inns are fine and you know what you are getting but no one could call them inspiring ! The snow wasn’t bad thank goodness and we had a lovely drive through the Cairngorms. We had decided that we would do something for ourselves this trip, so we went to Dundee next (memo to self … go back another time because on the road down there are lots of Antique centres – more about that later). I found a very comfy Guest House a little way out of town, and Mark found a very nice restaurant nearby, so that was our evening sorted. And our day could then be spent at the V&A museum that has opened there, and most enjoyable it was too. It’s not big, but it’s interesting and a great way to while away an afternoon without being overwhelmed by a plethora of exhibitions. Monday saw us at the Hyundai Garage where they did the recall work in record time. And we wandered off to Hexham, where again we found an excellent hotel with good food (I think Mark will remember their rhubarb souffle for a long time). A wander round the Abbey in the morning was interesting and sort of soothing. And as we left Hexham, Mark spotted a sign to an Antiques Fair – so that couldn’t be resisted. With some difficulty we found a parking space and whiled away a couple of hours or so wandering round a lot of stalls. We don’t buy anything, we just find it all fascinating – our sad addiction to TV programmes about antiques comes to the fore! And somehow there is always that hope one might spot something. We managed it in Peterborough one time where we found a lovely Inuit Polar Bear carved in jadeite. And as we left … the car went PING and said it needed a service. NOW it tell us !!! Grrrrrrrrrr. Bear in mind that this has to be done by an Arnold Clarke Hyundai dealer of which there is a marked lack on Orkney. So this might mean aNOTHER trip south at great expense. We met up with my lovely granddaughter Jasmine in Whitby and had a super evening with her, then on down to Suffolk to the Railway Station where we used to live where our great friend Steve (well, I am sure he is the lovely brother I never had really) lets us use him like an hotel. We caught up with all the family there which was fabulous, then headed over to Bristol to commiserate with my daughter Catherine, fresh out of hospital following some rather major ear surgery and a titanium implant, so it was good to give her some gentle hugs. Now time to head north, we called in at 3DGBIRE which is the company that supplies Mark with his 3D printer and filament – really interesting to see their setup. I will get Mark to do a blog about his 3D printing sometime as it’s come on apace and he is doing some super work with it. Then on to Glasgow where – guess what, there is an Arnold Clarke Hyundai dealer where they were able to do the service on the Thursday morning. And do it they did in record time so that we then legged it up the A9 (keeping the speed limits of course as it’s SPECS cameras all the way), and managed to get the ferry that evening. Which was just as well really as the swell on the water wasn’t too bad then but horrid the next day and the Saturday ferries were cancelled it was so bad. And so home … to bed. A long trip (we did 2,000 miles in the 2 weeks) but a great trip, good fun, but now time to settle back at home and look forward to spring and summer on Orkney with various visitors arriving to enjoy it with us.